Please download our stunning catalogue to browse at your leisure. We can also supply any of these chains in custom made lengths, and also in 18ct gold if you prefer, please call us on 07 5528 6688 or email for a price. At Gold Buy the Gram it's so easy to work out how much you will pay for any one of our beautiful 9ct gold jewellery pieces - just multiply the weight shown next to the item you like in our catalogue by the price per gram - just $49 per gram - and that's how much you will pay (gst included). Chain weighing 11.70 grams = 11.70 x $49.00 per gram = $573.3. That's your buy price including gst. Price per gram is in Australian dollars. The item code, length and weight are clearly visible next to every piece of jewellery so it's easy to place your order and calculate your price. Please note all chains are made to order so please allow 2-3 weeks for delivery. You can pick up your chain from our established business on the Gold Coast or we can post it to you by secure post. We want you to be confident in doing business with us. 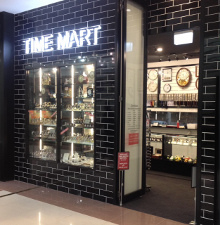 We have been trading on the Gold Coast for over 13 years in our watch and jewellery retail store. Before you decide to buy please give us a call or email us to discuss any questions regarding our gold chains, delivery times, availability of goods, or payment options. Laybuys are welcome! All credit/debit card payments accepted through PayPal. All chains and bracelets have a 2 year guarantee against any manufacturing defects. All chains shown as close as possible to size. If there is a fault, please return the item for repair at no cost to you (we will refund your secure post). Please choose carefully - we do not refund or exchange as items are made to order. If you have any questions, please give us a call on (07) 5528 6688. We want you to be confident before you purchase.